Stems erect to sometimes ascending or rarely prostrate, branched, rarely simple, usually (0.5-)1-2(-3) m. Leaves: petiole 1/4-1/2 length of blade; blade ovate or obovate proximally, oblong or elliptic to narrowly lanceolate distally, 1.5-15 × 0.5-3 cm, base cuneate, margins entire, plane, apex obtuse or rounded to acute. Inflorescences terminal, linear spikes to panicles, occasionally interrupted-moniliform, remote, globose glomerules. Bracts: of pistillate flowers 1-2 mm; of staminate flowers with inconspicuous to prominent midrib, 1-2 mm, apex acuminate to short-subulate. Pistillate flowers: tepals absent or 1-2, often rudimentary, 1-3 mm; style branches ± erect; stigmas 3. Staminate flowers: tepals 5, inner tepals with prominent midribs excurrent as rigid spines or not, equal to unequal, 2-3 mm, apex obtuse to acute or acuminate or indistinctly mucronulate; stamens 5. Utricles dark brown to reddish brown, not ribbed, obovoid to subglobose, 1.5-2 mm, thin, almost smooth or irregularly rugose, indehiscent, irregularly dehiscent, or dehiscence regularly circumscissile. Seeds dark reddish brown to dark brown, 0.7-1 mm diam., shiny. Flowering summer-fall. Wet areas, such as margins of rivers, ponds, marshes, lakes, and creeks, disturbed habitats, such as agricultural fields, roadsides, and railroads; 0-1000 m; introduced; Man., Ont., P.E.I., Que. ; Ala., Ark., Calif., Colo., Conn., Del., Ga., Idaho, Ill., Ind., Iowa, Kans., Ky., La., Maine, Md., Mass., Mich., Minn., Miss., Mo., Nebr., Nev., N.H., N.Mex., N.Y., N.C., N.Dak., Ohio, Pa., S.C., S.Dak., Tenn., Tex., Vt., Wash., W.Va., Wis.; introduced, usually not naturalized, in Europe and other continents. 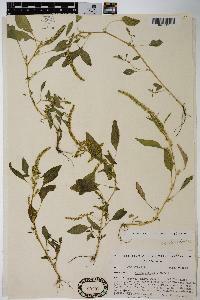 J. D. Sauer (1967b, 1972b) separated Amaranthus rudis (A. tamariscinus) as distinct from A. tuberculatus, based primarily on absence of tepals in the pistillate flowers and indehiscent fruits. Recent work by D. B. Pratt and L. G. Clark (2001) showed that those characteristics are not constant and they recognized only one polymorphic species, A. tuberculatus. Long-term observations by K. R. Robertson strongly support the inclusion of A. rudis within A. tuberculatus. Amaranthus rudis probably was originally native to the Great Plains west of the Mississippi, from Texas to Iowa. Amaranthus tuberculatus likely had a more northern range, north of Missouri and Tennessee to the Great Lakes. The emerging evolutionary differentiation between the two related taxa was erased by agriculture and human-induced introduction and invasion. 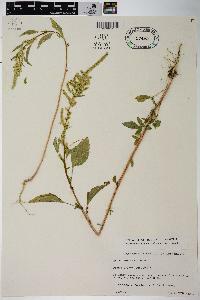 Amaranthus tuberculatus has become a major weed of agricultural fields and other disturbed habitats and is now introduced in parts of North America far outside its original range. Infrequent to common in all parts of the state on the muddy banks and bars of streams, on the borders of ponds and sloughs, in ditches and dried-up ponds and sloughs, and in moist, alluvial cornfields along streams. This is strictly a low ground species and is very common on the muddy slope of the bank of the Ohio River. My specimens [of Acnida subnuda] are from the muddy slopes and bars of our larger streams. This species is closely related to the preceding one [Acnida altissima] and is separated from it primarily by its prostrate habit and by its larger seed. I found this species [Acnida tamariscina] in 1919 and 1921 to be common in sandy soil about a half mile east of Lyle, Gibson County, along the roadside and in adjacent cornfields. I found it also as a common plant, 4-6 feet high, in a roadside ditch 4 miles south of Johnsonville, Warren County. This location is in the prairie area of the state. I have also a specimen collected by Umbach in ballast near Miller, Lake County. From what I can learn of the habitat of this species I think it is a native of the western part of the state. Blatchley says he found it to be common along the Wabash River in Vigo County on gravel and sandy banks which is the preferred and native habitat of the species.